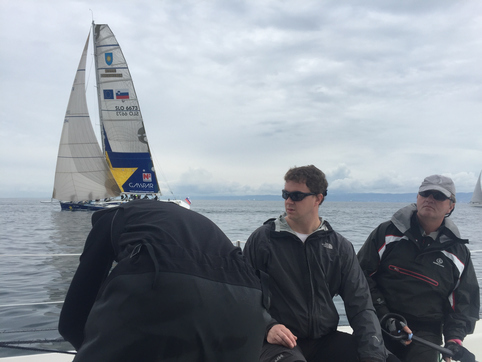 We had a great sailing day onboard Pila, Justin Ten, at Marinada on Slovenian coast. Start and finish were before the marina Izola and the 5 marks were located alongside the coast. It was a go-round navigation with the fleet of 47 boats. We had a good start and managed to keep 7th overall and 2nd position in the class most of the track, but where we were overtaken due to several mistakes. On approaching the 4th mark we lost most of our advantage due to bad navigation that was followed with scraped spinnaker and miscommunication after the 5th mark. Nevertheless, it was a great time and a 9th position overall, 3rd in the class, and enjoyable sunny day on the water, while most of the country had a rainy day, will be remembered.